This morning, I was putting the finishing touches on my face. You know, the quintessential mascara-with-mouth-wide-open move, and concealer for the circles under my eyes; trying (successfully?) to cover the fact that I was up reading a delicious new book all night. I was in the zone. Thinking about the day's meetings, interviews, stories to be written. Totally submerged in the roundabout of preparing for the work day. Then it happened. I realized I was a real-life grown up. Right as I spritzed my perfume on my wrists and rubbed behind my ears. Just like I had watched my mother do when I was a little girl. Not too much she would say, her smile and eyes bright. She would only do this on very special occasions. She savors the things that are special to her this way. But when I'd very quietly open up her jewelry box, or the drawer where she kept her silk scarves, the smell of her perfume would billow out. Loveliness everywhere. I was captivated by her from the start. She was a real-life grown up. She rolled her hair into red steam curlers. She opened her mouth when she put on her blue mascara (it was the nineties, y'all). She was in her twenties. She was young, vivacious. Timeless. I would watch her get ready every morning, starry-eyed. It was like seeing one of my favorite fairy tales come to life. I felt safe and strong in her beauty. Not just her outward beauty, but her inner beauty. It was expressed by her love, by way of her prayers and whispers to me. And by the little dab of perfume she'd dab on my tiny, eager wrists. Because I wanted to be a real-life grown up, too. Now, I'm the woman in my twenties. I have my own perfume that I dab on my just-as-eager wrists. And I think of all of the traits that know my name because my mother taught them to me. All of these things I learned being a curly-haired girl, just watching, watching my mother. 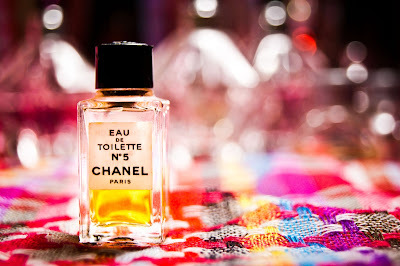 When moments like putting on perfume are as profound as taking our first steps and writing our first words. One day I'll teach my daughter the same. I'll say not too much when I share my perfume with her. But I won't be sparing with my love for her. I won't discourage her from having too much faith, joy or peace. Because those are traits billow behind you like the train of a dress, like a sweet perfume that follows you. Those are the things my mother taught me as she put on her perfume. What about the brothers, sister? Great story. Coming to my Senses by Alyssa Harad.